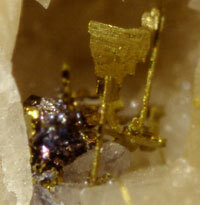 Blocky or Equant â€“ Roughly box-like or ball-like, as in pyrite. Tabular - Shaped like a pad of paper (thin tabular) or a deck of playing cards (thick tabular). 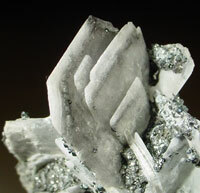 Bladed - Long thin crystals may be flattened like the blade of a knife. 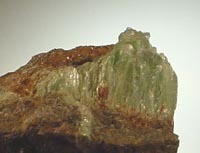 Actinolite is often bladed. Filiform or Capillary â€“ Like hair or thread. 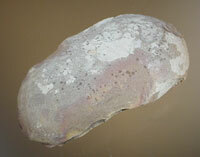 Druzy - Covering a surface in more-or-less outward pointing clusters of small crystals, such as druzy quartz crystals. 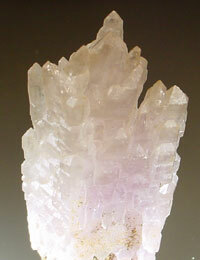 Divergent or Radiating - Growing outward from a point in sprays or starbursts, such as some hemimorphite exhibits. 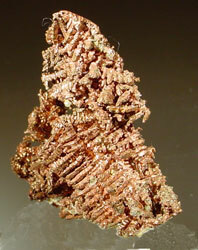 Reticulated â€“ Interconnected like a lattice or trellis, such as rutile. 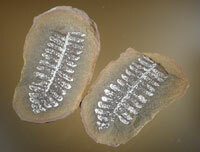 Dendritic or Arborescent - Slender divergent branch- or fern-like clusters, such as some native silver crystals. 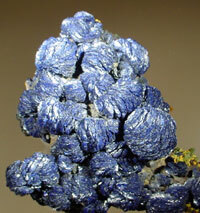 Columnar â€“ Stout parallel clusters with a column-like appearance, such as some forms of the serpentine minerals. 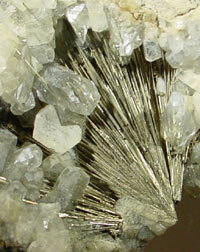 Fibrous â€“ Aggregates of parallel or radiating slender fibers, such as chrysotile. 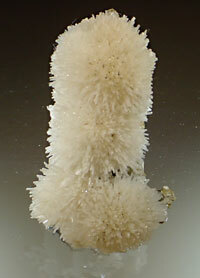 Stellate â€“ Long thin crystals radiating outwards in all directions, like a starburst or in a circular pattern, such as astrophyllite. 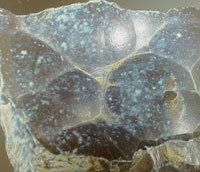 Spherical or Globular â€“ Compact clusters radiating outwards forming rounded, ball-like, shapes. Botryoidal â€“ Globular or ball-like clusters â€“ like a bunch of grapes. Mammillary â€“ Large rounded masses resembling human breasts. 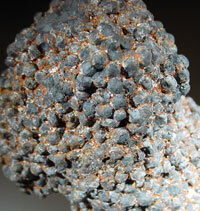 Reniform â€“ Radiating compact clusters of crystals ending in rounded, kidney-like, surfaces, such as hematite often exhibits. Foliated â€“ Looking like overlapping flakes or leaves and easily separable into individual leaves or flakes, usually at least somewhat "wavy" in appearance, such as the chlorite minerals. 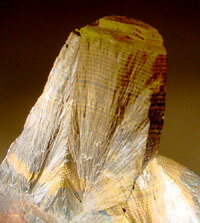 Micaceous â€“ Like foliated, but splits into very thin sheets, like the mica minerals. 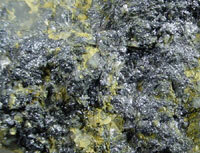 Lamellar â€“ Flat, platy, grains thicker than flakes or leaves, but overlapping like foliated, such as molybdenite. Plumose â€“ Feather-like sprays of fine scales, similar to dendritic but with a much finer structure, such as one form of native silver. 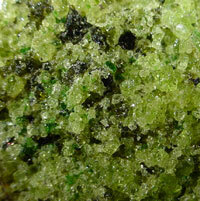 A mineral composed of grains is simply said to be granular. 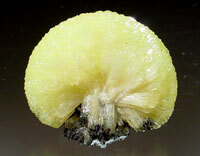 Granular minerals may be composed of rounded or semi-rounded grains, or of angular grains. 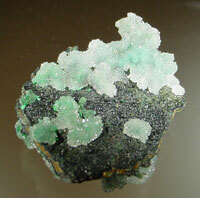 Massive â€“ No crystal structure visible, though the mineral may be crystalline. 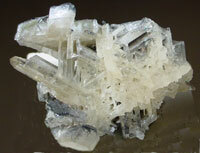 Some massive minerals may also be granular. 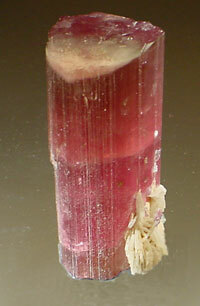 Banded â€“ Showing different bands or layers of color or texture, as in some agates or some fluorite. 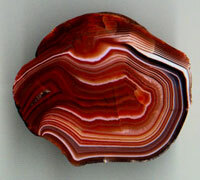 Concentric â€“ In rounded masses showing layers around the mass in shells, working outward from the center, as in some agates. 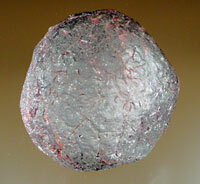 Oolitic â€“ Masses of small round spheres about the size of fish eggs (0.25-2.0mm). 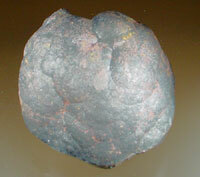 Pisolitic - Roughly pea-size rounded masses. 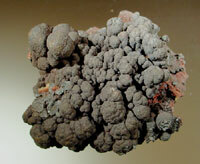 Concretionary â€“ Masses formed by mineral being deposited around a nucleus, may be spherical or rounded but may also be a wide variety of other shapes. 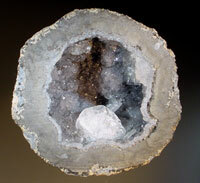 Geode â€“ A rock with a hollow, roughly spherical, interior with concentric bands of mineral (usually agate) on the wall and possibly crystals on the interior surface, pointing inwards. 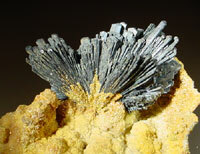 A wide variety of other terms are also used to describe mineral habits. Usually they refer to loose associations with common objects or concepts and are readily apparent when the term is used in context with the form present in the mineral at hand.